During the entirety of the process, you will be able to monitor the specifics of your project on our 24/7 Online Project Access system. From budget to work schedules, everything is transparent. Have a look at an example of how well informed you will be from start to finish! Having a conversation with us is the best way to get started. That's why we make it simple and comfortable to do. No pressure, no expectations and no obligations. We understand that you just need to talk with a knowledgeable professional to figure things out. We will take the time to understand your goals. Taking into consideration things such as the property you want to build on, your design wants and needs, your budget and more, we will help you set a course to success. We will answer all your questions and empower you with information that will help you determine if building a custom home is possible and right for you. So, feel free to call us or email us. We can help you choose or design your basic concept and house plan that meets your needs, site requirements and budget. Within a few short days from first contact, we can provide you with a no-obligation rough estimate for your dream home. Once we help you develop that confidence that you can build your custom dream home, we will help you make sure you can finance it. We don't want you spending your hard earned money on plans, permits, engineering and other costly expenses before you are certain the bank will lend you the money. We help you avoid such risk to financial loss. We help provide you and the bank with everything necessary for a loan approval prior to you spending a dime on pre-construction costs. We even have hundreds of lenders we can recommend that offer quality financing terms and unique programs (such as 100% financing). Take a look at just some of what the lenders we can recommend have to offer you. Once you have the go ahead from the bank, we will help you move forward with the rest of the process. Even if you have selected one of our many standard plans, it is likely you will want to make a few minor modifications. You may want to change window placements, put in or remove a kitchen island, raise first floor ceiling heights, etc. 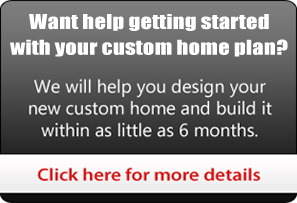 With a complete custom plan you will undoubtedly still have such decisions to make. In either case, we will work with you to finalize things such as, but not limited to, the following; floor plan layout, window placements, outlet placements, molding and trim packages, material selections, color choices and more. We will re-verify that you are still on budget and within the bank's approval based on finalization of your home design and selections. Once complete, your plans will be finalized and prints will be produced to submit for bid packages, obtain permits, etc. Once your plans are finalized, we can submit bid packages to competing subcontractors. This process will verify we are helping you obtain the best possible value for every facet of work that goes into your new custom home. Once we have the absolute best bids for your job selected, and the costs are verified to be within your budget, we will advance to a contract for work. When the contract is reached, we will work with you to obtain all necessary soil tests (if applicable), engineering (if applicable), approvals, permits, surveys and more. When building with a custom modular home design, the timing in which your home is ordered is critical if you have a specific completion date in mind. Some projects necessitate that we order the home as soon as the basic house plan and design are developed and priced. Other projects have a less demanding completion date and we can wait until all issues are finalized. Subcontractor availability, weather and production lead times can all factor into this decision. We take into consideration our clients completion time goals and work closely with all parties to accommodate scheduling requirements. Now that everything is in place, you will close with your bank to make funds readily available. The goal is to have your home completed within 3-6 months from the time of your loan closing so we will break ground right away. The job schedule, running budget, purchase orders, change orders, job communications and more are all available through our 24/7 Online Project Access system. You will know if your job is running on time or if any factors have delayed it. There you can also track everything that is going on with your home, request change orders, approve job requests, view photos of completed work phases, upload your own photos and much more. Curious of what types of things occur when construction has started? Click here to view an example of a typical custom home construction flowchart. Within just a few short months your beautiful new custom home is completed and your certificate of occupancy is received. It's time to move in but we're not done yet! Remember that your Cassio Builders custom home comes with a 2/10 Home Warranty. We will now show you how our 24/7 Online Project Access system makes the warranty process a cinch. In the event of a warranty request, your communication with us is simple, clear and concise. And we will respond swiftly to set things right. Our goal is your 100% satisfaction for years to come.